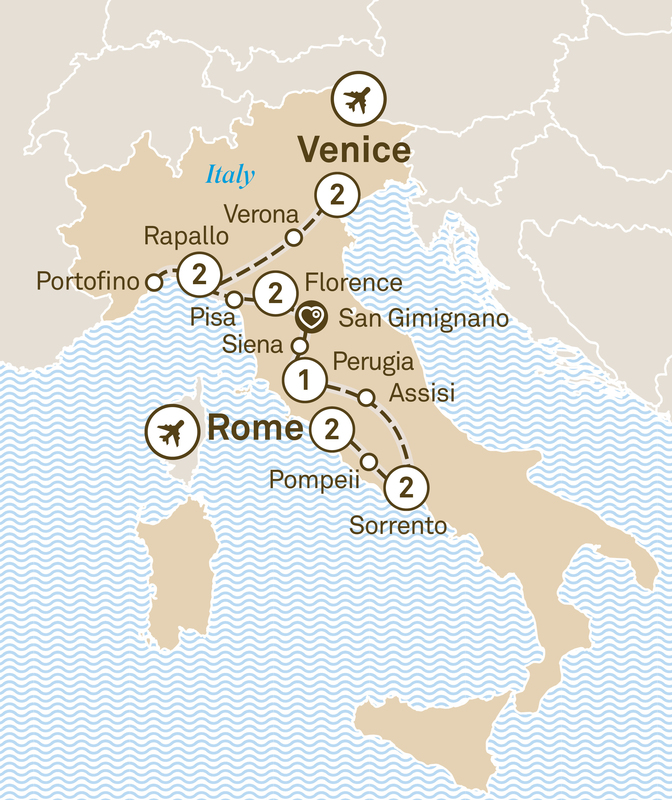 Experience the best of Italy's cuisine & culture on this 12 day luxury tour from Rome to Venice. Savour the delicious Italian cuisine & sample local wines. Just like this extraordinary itinerary, the story of modern western civilisation begins in Rome, Europe’s grandest metropolis. The road from the ‘holy city’ will introduce you to towns and cities that represent some of the highest points in European culture. Discover the world of the ancients, see the story of the Middle Ages unfold, and enter into the profound world of the Renaissance. From Florence to Portofino, from stunning Verona to Venice you can look forward to a bevy of beautiful towns, with art and architecture to match. Welcome to Rome. Your Italian adventure begins at your hotel with a walking tour of this ancient city. Your expert local guide will show you key landmarks like the Spanish Steps and Trevi Fountain. Please schedule flights to arrive before midday. You’ll start your exploration in the world’s smallest state, the Vatican City, where you’ll see such marvels as the Vatican Museum, the breathtaking Sistine Chapel and St. Peter’s Basilica, the world’s largest church, which leads to the magnificent St. Peter’s Square. From there, you’ll continue to the Forum and the historic Colosseum. This morning venture to the unique site of Pompeii, before continuing to Sorrento, where you’ll enjoy a luxurious two night stay. Feast on traditional Italian food at a home-hosted dinner. The only thing better than home-cooked Italian food is Italian hospitality, and you’ll enjoy healthy servings of both. Relish the view as you take a funicular ride to Capri town. Alternatively, visit Positano, the Amalfi coast’s most picturesque and photogenic town. Your first stop today is the medieval village of Assisi. Then, it’s only a short drive to Perugia to view the Fontana Maggoire and the monuments around the site of the Roman Forum. Tonight, you’ll get to enjoy your wonderful hotel, located in the historical heart of Perugia. Today drive past tranquil Lake Trasimeno to Siena, a delightful medieval city, where you’ll enjoy a guided city tour. Visit a Tuscan farmhouse and discover local wine and oil production techniques. Later, enjoy a tasty rustic lunch featuring the region’s wine and produce. Continue to San Gimignano for a tour of the city, before heading to Florence for a two night stay. Delight in a walking tour of this art lover’s paradise, including a visit to the Academy of Fine Arts to admire Michelangelo’s David. Savour delicious Italian cuisine at one of Florence’s superb local restaurants. Travel to Pisa to enjoy a guided tour and see its famous tower. Then continue on to Portofino, where you’ll enjoy a scenic cruise, before arriving in Rapallo for a two night stay. The rugged coastline known as the Cinque Terre, is a World Heritage-listed Site that comprises the five villages of Monterosso al Mare, Vernazza, Corniglia, Manarola, and Riomaggiore. They’re accessible only via walking paths, train or boat, which lends itself to the already considerable charm of these unique 11th century villages. Today, you’ll enjoy a full day exploring this picturesque coastline. Your first stop today is Verona, where you’ll see Juliet’s Balcony and the main square, Piazza Bra. Continue to Venice – a truly unique city. Your opulent hotel is located just moments from the Piazza San Marco, and you’ll cherish your two night stay for a lifetime. Marvel at the beauty of historic Venice during a guided walking tour, including the Basilica of San Marco. This afternoon take a romantic gondola ride along the famous canals. Your journey ends today and depart to Venice airport after breakfast. Follow in the footsteps of the greats & discover the delights of Europe's finest destinations on an all-encompassing 29 day journey from Rome to Amsterdam.